Will Gold Hit $1500 an Ounce? Gold speculators and traders have wondered for a while now whether gold will reach $1500 an ounce in the near future. The gold market like other investments doesn’t move in straight lines but rather in waves of up and down activity. This presents a unique opportunity for gold investors to profit on the short term as well as get in at a good price to make some immediate gains. All of this gold trading activity is especially prevalent when there is a lot of volatility in the currency and commodity markets like we are seeing recently. Here are several of the top reasons we should see gold hit $1500 and ounce and above in the near future. #1 The declining U.S dollar: As the dollar declines the price of gold has traditionally gone up. Frank Holmes the CEO and chief investment officer of U.S. Global Investors says, “Gold is attractive as a safe haven when the dollar is declining.” As the U.S deficit continues to grow it puts additional strain on the Dollar as the worlds reserve currency. All of this pressure on the dollar creates a need to seek additional investment opportunity in alternative as investors seek out other currencies and markets to put their money in. #2 Inflation: The price of goods services and the continual rise of these prices, coupled with the increasing price of oil and other commodities has a tendency to drive people toward investing in gold. 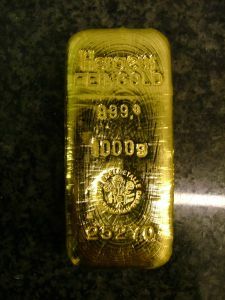 Putting money in gold has is typically seen as a safe place to invest money when there is an inflationary environment. Russ Winter of the financial blog Minyanville believes, “if the Fed keeps buying $100 billion of Treasuries until July 1, you can calculate that each $100 billion will push the commodity index up another 5% and the price of oil $7.00 a barrel. #3 Increase in Oil Prices: when oil producing nations begin reaping record profits they often invest their excess capital in gold. With the general consensus believing that oil prices will continue to go up the outlook for continually increasing gold prices looks optimistic. Frank Holmes has believes that oil and gold have an approximate 75% correlation to each other. “This means that 3/4 times, when prices for one go up, prices for the other increase as well,” Holmes writes. The general consensus is that the price of gold and oil are very likely to continue going up through the final months of “quantitative easing” QE2. Gold prices should continue to follow closely with other commodity prices. As geopolitical events continue to unfold in the Middle East precious metals should benefit.